Remember how I mentioned (in this post) that I had pre-ordered and then canceled my pre-order for Super Mario All-Stars: Limited Edition? Well, I pre-ordered it again a few days later, despite the fact that I've never been much of a fan of Nintendo's 16-bit re-workings of its NES Super Mario Bros. titles. 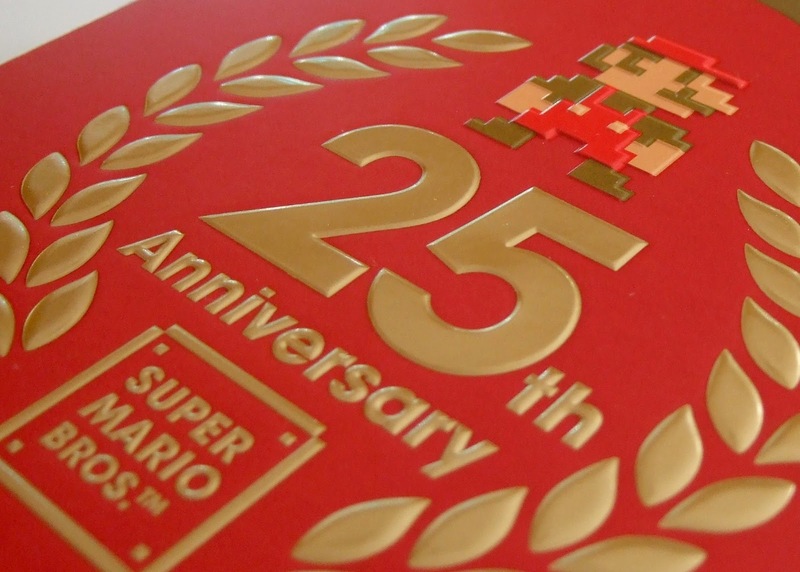 I changed my mind for three reasons: 1) I wanted the CD soundtrack, 2) I wanted the 32-page "Super Mario History" booklet and 3) I thought the entire package seemed well worth the $29.99 price tag--especially since it's supposed to be a limited release. Was it worth it? I think so. Hell, I'd have paid $29.99 for just the booklet, CD and embossed exterior packaging (above). I 'caved' when I bought mine also. But in truth, I didn't think the booklet was that good, nor was the CD. Nice collection overall (Like you said, embossed exterior packaging, yay!) but I couldn't help but be like 'meh' afterwards. Oh well. I would've been more frustrated if I hadn't bought it anyway. Hey there, SUIKA. I like the booklet, but I agree it could have been so much more. It could have been larger, made out of better/thicker paper, etc. It definitely should have had more in-depth interviews. Still, I like what I got, too. So...you'd recommend this, then? I was on the fence. I'll ask my mom for it for Christmas. Do you like Super Mario All-Stars in general, Justin? If so, I think you'll find this worthwhile. Like I said, you get the game plus a (fairly short) booklet about the Mario games, a CD soundtrack and some cool packaging. If you already own SMB, SMB: Lost Levels, SMB 2 and SMB 3 on the Virtual Console and you have no real interest in All-Stars, though, I'm not sure I would recommend it. I know I'm kind of hedging, but I really think it depends on what you think of All-Stars in general. If you loathe it, there probably isn't enough here to make you happy you shelled out $30 for it. No, I like it. I have the original SNES cart without SMW. To me, the best thing about releases like this one -- and VC releases, too -- is how crisp the emulation is. By the way, speaking of Nintendo codes. The rewards that were sold out are back! I just spent 550 coins to get the messenger bag! I can't wait for it to get here!! AHHHH!!! !